Whenever you read a health care article, paper, book, blog post or even tweet, that substitutes the term consumers for patients, and the term providers for doctors, or physicians, you should inherently assume that the authors are advocating for something that will not benefit you or the people you care for, something that will most likely harm you financially and if you happen to be less than independently wealthy it will harm you physically in real and immediate ways. These advocacy pieces usually come dressed in the sheep clothing of empowerment, liberation, convenience, savings and democratization, but underneath it all, and often unbeknownst to the authors themselves, there is always an ominous incarnation of the wolf of Wall Street. Whenever you read something emanating from selfless, do-gooder (usually public or supposedly not-for-profit, but certainly for-revenue) institutions, alliances, consortia, coalitions, and such, note how you are always addressed in the third-person plural. There is no “we” in what passes as enlightened health care conversation. As Dr. Victor Montori astutely observed, there is no “sense of a shared fate. Of a shared journey with our kin.” The wolves of Wall Street, and the hyenas of Silicon Valley dancing at their feet, have no kin and no intention of sharing in our fate. Consumers and providers are a uniform mass of transactional entities, neatly described by a finite number of discrete financial events. Consumers and providers are hence computable entities. You don’t often see articles about consumers being sad or happy, consumers laughing or crying, consumers falling in love or dying. Providers are never sued for malpractice, never accused of fraud, never disillusioned and they never commit suicide. The vocabulary used for consumers and providers requires that we strip everything human from the subject matter, and leave all that is mercenary and precisely quantifiable in dollars and cents. As the consumer/provider vocabulary is ported to health care, the entire endeavor by necessity is divesting itself of human considerations, including kinship and any remaining sense of a shared fate. Consumers, although sometimes patronizingly described as savvy, are not assumed to possess any particular wisdom. The only discriminatory behavior ascribed to consumers is the ability to discern cheap from expensive. Consumers are expected to incessantly shop for consumable stuff, like so many rats frantically searching for bits of cheese in a carefully constructed maze. We are expected to shop when things are hunky dory and when things are down in the dumps. We are ordered to shop in the face of national tragedies, and now we are ordered to shop when personal tragedy strikes as well. We are ordered to shop for life saving medicine. We are ordered to shop for surgeries, and we are ordered to shop for “relationships” with our “providers”. We are effectively ordered to shop for dear life, and to “share” and “rate” our shopping “experience” to better inform the maze designers. The government of the United States wants us to shop for health insurance every twelve months. Health insurance companies want us to shop for cheap services all through the year. ProPublica and the unparalleled paragon of social beneficence called Yelp, are volunteering to help us do a better job at shopping for “providers”. Glitzy startups like Amino, will “harnesses health Industry data for consumers”, to show us some information about some doctors, for no particular reason and free of charge, because “the initial goal is to create an appealing product, and then figure out a business model later”. Yes, it makes perfect sense that Mr. Vinod Khosla and company would sink almost $20 million in something not projected to have any returns. After all, the entire Silicon Valley Empire was built this way, and now the time has finally come to fully align health care with Silicon Valley and Wall Street ways of doing business. A fundamental shift in how we are being programmed to think about health care is therefore underway. The rather recent term “consumer-centric healthcare” is now brazenly accompanied by musings on who will be “herding” consumers’ medical records. Following the subtle transformation of health care to “healthcare”, we are beginning to shift the conversation to just “health”, because the “care” part seems redundant. Health care is not too expensive because insurance companies operate like Columbian drug cartels and pharmaceutical companies are essentially drug cartels. Health care is not too expensive because hospitals are coalescing into regional and national monopolies, unchecked and undeterred by the perpetually fund-raising legislative and administrative corps of career politicians. Health care is not too expensive because people who work for a living haven’t gotten a raise in decades. No siree, Bob! Health care is too expensive because consumers lack the wisdom to be healthy, and providers, i.e. the nondescript entities tasked with pushing “appropriate” processes and products to consumers, are failing to keep consumers healthy (a.k.a. profitable). Consumers must be reformed to be healthier, and providers to be more productive producers of health. To prime the pump, health care itself needs to be transformed from a quirky personal service to a standardized population management industry ripe for plunder (a.k.a. disruption). And then, who better to reform consumers than the high tech propaganda machine? Over the years we were reformed to happily ingest every edible poison known to mankind. We were reformed to bash the brains out of fellow consumers every Friday after Thanksgiving. We were reformed into a trembling mass of righteous fear and indignation that can only function (when properly medicated) in “safe spaces” devoid of intellectual ambiguity. We were reformed to not just accept, but clamor and pay a premium for the right to carry consumer profiling devices in our pockets, which are used to chart our future in minute detail. Healthcare “futurists” are painting for us abstract visions of healthcare where “health is primary”. Futures where medicine is devoid of hospitals, human doctors and human patients. Futures where you buy genetic analysis from 23andMe on your TV, and fixing your baby in utero is a weekend DIY project. Futures where we need not care for each other because the iPhone Gods are caring for us all. Will we be happy? Will we be free? Que sera, sera…. But our health has always been affected mostly by social order, and less so by health care. As Silicon Valley and Wall Street are taking command of our health, what will be, will be affected by factors far removed from the myopic analysis of our healthcare experts. 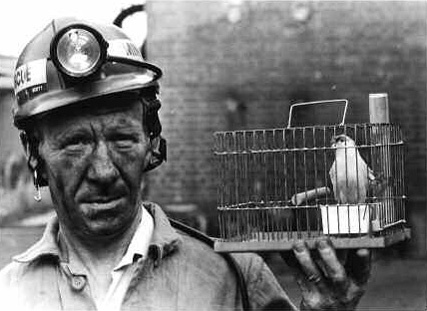 Fortunately, we are bringing our canary on the journey down this shaft. Unfortunately, the canary is dying. Mortality rates have began to rise for white, middle-aged Americans without a college education, arguably the people most vulnerable to the mercantile siliconization of life. They use mostly alcohol and opioids to numb the pain and eventually they numb it for good. Unless we find our way out of these toxic dungeons where life is money and money is life, right here, right now, most of us, consumers and providers alike, will suffer the same fate. This is the real clear and present future of consumerized health.